I originally came to ask about X79 quad channel bandwidth, and if that would ever be updated to reflect the quad channel performance. But, before posting here tonight I installed the latest final to check if that had been corrected before I made a thread about it, and I've just ran into another issue after updating to the latest final so I better include that as well. I do see you've been working on SMART data detection on X79, so that may have something to do with this, the issue is now with a single disk in RAID mode it stalls out during the initial loading at "Scanning RAID devices". This did not happen in the previous version I was using, the older 2.20.1800 version. It's also takes many attempts to kill the process in task manager when this happens. So I think you need to test with single drives using in RAID mode on X79. 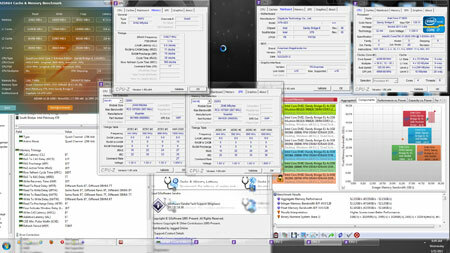 Note, I do not have ANY RAID arrays built, only single drives in RAID mode. However, if I reboot and connect a secondary drive before windows loads, or hot-plug one after windows has loaded (Or AIDA64 is stalled), then it only stalls for a short time - maybe 30-45 seconds and eventually loads. I have waited up to five minutes for it with only single drives connected, it never gets past the scanning for RAID arrays. This is with the 3.0.0.3011 Enterprise drivers, if that matters. I have not tested if the same occurs with 11.5 or earlier drivers, but I can if you need me to just let me know! Now, for my memory issue/request. On X79, using dual channel 128-bit the Cache and Memory Benchmark results are the exact same as using quad channel 256-bit, these results should not be the same or even similar, they should reflect the 256-bit quad channel mode and they do not. 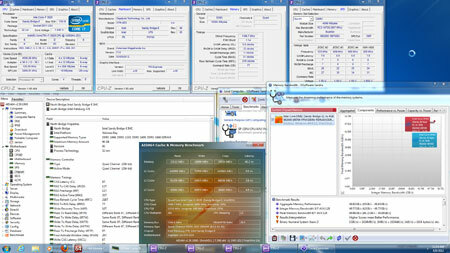 Other programs such as SiSandra reflect the memory bandwidth differences as shown below. So, can this please be corrected in a future update? Surely I can't be the first to notice or ask about this right? It would be great if this could be fixed quickly as I'm doing an X79 review right now, but I know it's probably something you can't just fix overnight or you would have already. If you need any CPU-z or R/W-Everything dumps, ect. from me just let me know - Thanks! The RAID thing isn't a huge issue for me right now, but it should be corrected of course. But it would be really awesome if you could get the Cache and Memory Benchmark updated soon, thanks!! Thanks for all your hard work, love this app! OK, upon further testing and multiple reboots, it's now finally loading past RAID scan with single drives in RAID mode. I take that back, another few reboots and it's stalling again on RAID, so something is up with it when single disks are used in RAID mode for sure! BTW, since at Intel RAID scanning we're doing everything "by the book", and full SMART details are unavailable even when it loads up fine, all we can hope for is that Intel will soon release a proper, fixed RST Enterprise driver. BTW #2, have you tried to use the latest Intel RST Enterprise driver 3.0.1.7016 WHQL? Maybe it would help about the slowdown. As for the quad-channel memory bandwidth results, they are actually accurate. The single-threaded memory bandwidth performance -- that AIDA64 currently measures -- doesn't scale when going from 2-channel to 4-channel configuration on X79 systems. We're already working on multi-threaded memory bandwidth benchmarks: they will be able to properly measure the performance improvement due to 3+ memory channels. 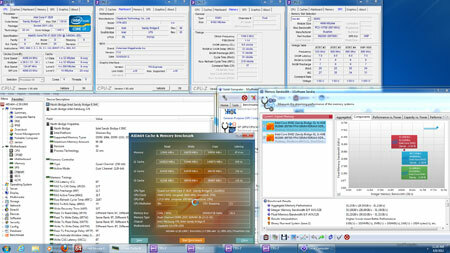 Meanwhile we've performed a few test runs with various RAID settings and configuration on our own X79 test system. With RST Enterprise 3.0.0.3020 WHQL driver AIDA64 startup is indeed noticably slow, although the delays we've experienced were no longer than 5 seconds. With RST Enterprise 3.0.1.7016 WHQL driver AIDA64 startup was much quicker, with no noticable delays due to RAID scanning. Thanks for your quick reply!! I wasn't concerned as much with the RAID issue, but I will indeed try out the newer drivers and if they don't help then I'll apply the other fixes you mentioned. I agree, I think the SMART issues are indeed due to Intel's drivers, since some older versions can show SMART data properly on X79! Hope they get this sorted out, and TRIM for RAID too someday as they mention! In your testing, did you test single drives only in RAID mode, with no arrays? That is how I am running when I see the issue, just in case I wasn't clear on that above. Anyway, thank you again for the quick reply!! I'll look into the RAID issue with your tips, and I'm really looking forward to the new multi-threaded memory benchmark!! Keep up the great work, your program is the best!! Tested RAID member enumeration disabled and that instantly fixed the issue! I will update the drivers as I should anyway, then I will re-enable this and see if it still happens or not. I'll let you know. Updated drivers to 3.0.1.7016, and re-enabled the above setting and everything works quickly as expected!! So thanks for the heads up, it seems the old drivers were causing issues with AIDA64 RAID member detection when no actual arrays were built, all working perfect now - thanks! Can you give a guesstimate on when the multi-memory benchmark version might be ready for testing? I could beta test for you if you'd like, I'm friends with Stasio - so maybe he already has posted a beta on this and I didn't notice yet? Core i7-965 with Triple Channel DDR3-1333 and X58 chipset has a theoretical memory bandwidth of 32000 MB/sec. AIDA64 measures 13899 MB/sec memory read bandwidth (cca. 43% of theoretical bandwidth). Core i7-3960X with Quad Channel DDR3-1600 and X79 chipset has a theoretical memory bandwidth of 51200 MB/sec. AIDA64 measures 16788 MB/sec memory read bandwidth (cca. 33% of theoretical bandwidth). So as you can see, with only a single thread it's not possible to get close to even half the theoretical memory bandwidth of such platforms. That explains why in single-threaded applications (like most 3D games) it doesn't matter if you use more than 2 channels for your memory While in heavily multi-threaded applications multi-channel memory configurations look much better. We don't yet have a beta of the multi-threaded memory benchmarks. We expect to roll the new memory benchmarks out in the 2nd half of 2012. It will be a major change, since all memory scores will change in the switch, so the new benchmarks will debut with a major AIDA64 version update -- probably v3.00. BTW, in the first half of 2012 we'll update other benchmarks like CPU PhotoWorxx to implement SSE and AVX optimizations. Thank you for your feedbacks on the Intel RSTe driver issue. AIDA64 does have a MemBW test in the debug menu, but i don't recommend running it since it is almost impossible to cleanly stop.